A woman has been jailed after she bit off her friend's ear in a takeaway shop brawl. Victoria Burgess, 27, was caught on film attacking her friend Jenna Edwards before pulling part of her victim's ear out of her mouth. 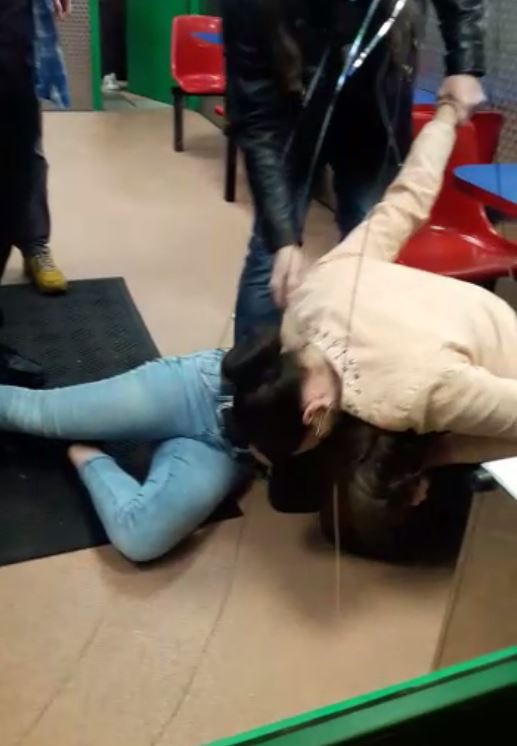 The mobile phone footage shows Burgess kneeling over her friend while aiming punches at her head. She then leans over and sinks her teeth into the ear. Burgess was filmed holding on to Miss Edwards' ear for 12 seconds as the victim is heard repeatedly shouting "Get off me, Victoria". Onlookers told Burgess "don't bite her" before she released her grip and pulled the torn part of the ear out of her mouth. Miss Edwards is then seen telling the takeaway shop's employees to "call the police" as blood begins pouring from her wound. The attack happened in Newport city centre in South Wales on April 6 this year at Yummies Kebab House. Burgess, a former employee of the city's South Wales Argus newspaper, pleaded guilty to wounding with intent before she was sentenced at Newport Crown Court on Wednesday. Judge Daniel Williams jailed Burgess, from Melfort Road, Newport, to four-and-a-half years in prison.